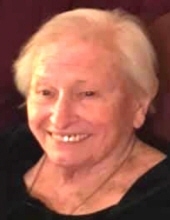 Beverly Joyce (Berken) Pichette, De Pere, passed away in the early hours of April 2, 2019, two days following her 92nd birthday. The daughter of Earl and Serena (Vannieuwenhoven) Berken was born March 30, 1927 in Green Bay. Bev grew up on the Berken Family Farm on Hansen Road in Ashwaubenon. She was the oldest of three children and loved playing softball and other sports. She graduated from Nicolet High School in 1944 and went on to work at the Standard Oil corporate office in Green Bay. On August 27, 1949, Beverly married James Pichette at St. Boniface Church in De Pere. Together, they raised nine children. Mom was a wonderful homemaker and the best mother that one could ask for. She loved to bake cinnamon rolls and homemade bread for the family and neighborhood kids. In later years, Bev and Jimmy enjoyed traveling, especially spending winters in Hilton Head Island, South Carolina. A decade’s worth of St. Norbert College students knew her as the “Salad Lady” in the cafeteria. It was a way for her to continue her caring ways after the kids were grown. Beverly is survived by her children; Mike (Cherie) Pichette, Sturgeon Bay, Geno (Betsy) Pichette, Shorewood, Susie (Jerry) Olmsted, Green Bay, Jim "Bimbo" Pichette, Seattle, Peggy Pichette, Sturgeon Bay, Chris Damas (Pete Schoultz), De Pere, Carol (Tom) Kros, De Pere, Mary Beth Pichette, De Pere, as well as Kathy Pichette. She is further survived by her grandchildren, Adam (Linnea) Pichette, Kirsten (Pete) Marto, Melissa (Jeff) Weinkauf, Megan (Michael) Anderson, Patrick (Brenda) Pichette, Jackie (Brad) Sanders, Chaz, Leslie and Daniel Pichette, Nicholas (Katie) Olmsted, Marie Olmsted, Mitchell (Heather) Olmsted, Hannah Damas, and T.J., Andrew, Matthew and Connor Kros. Bev is even further survived by her great-grandchildren, Owen and Frankie, Will, Sam and Lilly, Ethan, Emma and Ella, Luca, Ava and Vienne, Preston and Charlie, Santiago and Marcelo, Marie, Cecilia and Whitney, and last but not least, Elijah. Survivors also include Vonnie (Larry) McQuade, Alice Berken, Gladys Pichette, many dearly loved nieces and nephews, other extended family members, and many friends. She was preceded in death by her parents, Earl and Serena; husband, Jimmy; son, Pat; brothers Jerry and Ronnie (Joan) Berken. Family and friends may visit at Ryan Funeral Home, 305 N. Tenth Street, De Pere, from 2:00 to 6:00 p.m. on Sunday, April 7, 2019. Visitation will continue at 9:30 a.m. on Monday, April 8, 2019 at St. Mary Catholic Church, 4805 Sportsman Drive, De Pere. The Mass of Christian Burial will begin at 11:00 a.m. with Father Richard Getchel officiating. Entombment will take place at Allouez Catholic Mausoleum. The family would like to extend special thanks to the caretakers at Heartland Hospice, the staff at Allouez Parkside Village and Dr. Stephen Asma. In lieu of flowers, donations may be made to the Alzheimer’s Association of Green Bay, 3313 Packerland Drive, De Pere. To send flowers or a remembrance gift to the family of Beverly Pichette, please visit our Tribute Store. "Email Address" would like to share the life celebration of Beverly Pichette. Click on the "link" to go to share a favorite memory or leave a condolence message for the family.